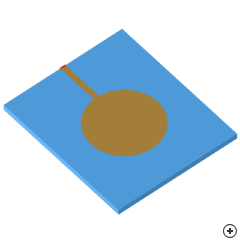 Image of the Microstrip-fed Elliptical Monopole. The antenna has been proposed for use in the FCC ultra-wideband (UWB) radio band of 3.1 – 10.6 GHz. A number of broadband monopole configurations have been used for this band but the radiators are perpendicular to the ground planes. The advantage of this antenna is that it can be integrated on the same printed circuit board as the transmitter electronics.